With short platinum hair, dark eyebrows and a velvet black dress that hugs her figure, Güneş Topalöz more resembles a 21st century version of a Hollywood femme fatale rather than a painter who draws tortured portraits. The 24-year-old artist, who has previously displayed her work in the prestigious Pera Museum in Istanbul, uses crosses in bright colors across the faces of her portraits as a replacement for her signature. “An artist’s signature is just a detail, a show of ego,” she said, with the determined expression you see in the young, while speaking to Hürriyet Daily News at the opening of the exhibition. Topalöz’s personal exposition titled “Güneş, I love you, You are Great. 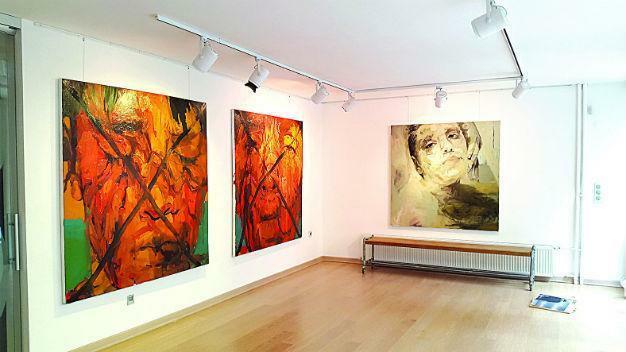 Now Change” on display at Gallery No2 the Aegean city of İzmir consists of larger-than-life portraits with haunted eyes, distorted faces and bodies twisted in panic. The artist, serene, with a soft, modest voice, talked to friends, family and perfect strangers amid those portraits while occasionally sneaking out to have a cigarette during the exhibition. Her sketches, or “Diaries,” are somewhat milder, with a touch of irony. “Mankind loves itself, even when it looks at its own ca-ca,” says a scribble in one sketch. It shows a figure that has bent over to examine something on the soil. Another sketch shows a naked figure, stretched to allow a shadow to emerge from within, rather like Siamese twins. But of all the works, possibly the most haunting is the one in the main room: A woman’s body in a double-twist at the corner, legs pulled to the chest and eyes, dark gray among the tones of red, that seem to move. “My work is about the struggle in me, what is there and what is not there, what I do not see in me, what I cannot reach. Those emotions or identities that make me uneasy,” Topalöz said. The title of the exposition “Güneş, I love you, You are Great, Now change” also reflects the young artist’s desire for change, both in her look and in her art. “She is restless, always had been,” said her mother, who was also in attendance. The canvases on the walls did not include her favorite, which she refuses to part with, despite offers. 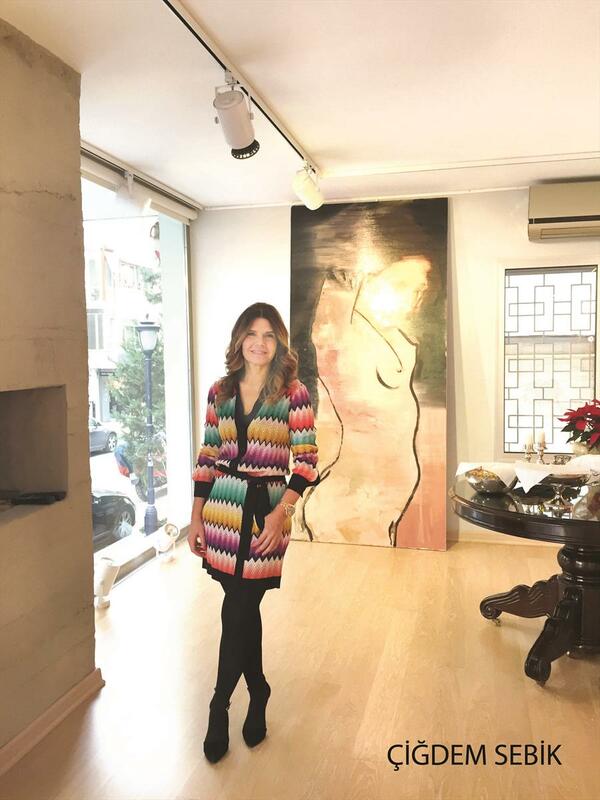 Gallery No2 owner Çiğdem Sebik has an eye for discovering İzmir’s young talents before they escape to Istanbul, the Mecca of art in Turkey. Her artist pool partly comes from Dokuz Eylül University’s School of Fine Arts, where she studied as a “mature student,” with classmates twenty years younger than her. Topalöz, born in 1991 in İzmir, is currently continuing her post-graduate studies at Dokuz Eylül University’s School of Fine Arts. She has been in several joint exhibitions in Istanbul, one in Pera Museum, called “Beyond Experience,” which included the works of the students of her university and one titled “Open Door” at Mısır Apartment. Her future plans are not clear and “will probably involve” moving to Istanbul, she said. Born and raised in İzmir, she described her hometown as one that “drives people to loneliness” - an unusual description of fun-loving İzmir - and to look for creativity within. Copyright (c) 2018 No2Sanat - Tüm Hakları Saklıdır.